HYPERSCAN PBS introduces novel energy layer switching and automated collimation systems. LITTLETON, Mass., January 3, 2018 – Mevion Medical Systems has received FDA 510(k) clearance for the MEVION S250i Proton Therapy System® including HYPERSCAN™ pencil beam scanning (PBS) technology. HYPERSCAN PBS introduces novel energy layer switching and automated collimation systems. These advantages enable the S250i™ system to deliver faster, sharper, and more robust PBS proton radiation treatments. The MEVION S250i™ system is a compact proton therapy system capable of delivering conformal radiation therapy treatments using HYPERSCAN pencil beam scanning technology. The design of HYPERSCAN PBS technology overcomes clinical challenges that were previously faced by first generation PBS systems. Pencil beam scanning systems shape the delivered radiation dose by “painting” tumors spot-by-spot and layer-by-layer with sub-atomic particles. Prior to HYPERSCAN PBS, scanning proton systems struggled with delivery speed. Long delivery times can undermine the high precision of the treatment due to the target tumor shifting under normal organ motion such as breathing. HYPERSCAN PBS uses a compact beam delivery path reducing delivery times to less than 5 seconds for some fields. This “hyper-fast” treatment delivery reduces treatment errors due to the sensitivity to motion that current PBS technologies face when treating tumors affected by organ motion. In addition, HYPERSCAN PBS utilizes, the Adaptive Aperture™ proton multi-leaf collimator (pMLC). This technology uses a robotically controlled collimation system, capable of trimming the edges of the beam at every layer of delivery. This capability delivers up to a three times sharper drop off in radiation at the delivery field edge. This improves sparing of healthy tissue and limits unnecessary radiation to sensitive locations. 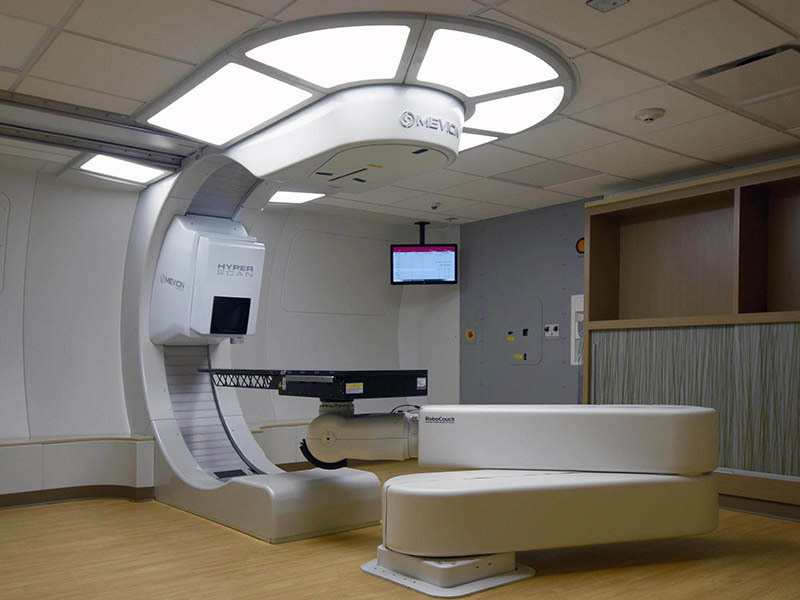 The MEVION S250i Proton Therapy System with HYPERSCAN Pencil Beam Scanning is shown here, fully installed at MedStar Georgetown University Hospital. MGUH will be the first hospital in the world to deliver proton therapy using HYPERSCAN technology. MedStar Georgetown University Hospital in Washington, D.C. will be the first hospital in the world to offer this latest generation of HYPERSCAN PBS once final onsite testing is completed this month. The MEVION S250i system is based on Mevion’s high efficiency, low financial risk S250™ Series platform. The core technology of the S250 Series is the world’s only gantry mounted superconducting synchrocyclotron. This compact, fully integrated platform has years of successful clinical experience and proven financial viability. While proton therapy has clear dosimetric advantages, the costs of early systems has been a significant barrier to adoption. The MEVION S250i reduces this barrier through lower capital costs, reduced operating costs, and increased treatment throughput. Mevion customers have achieved the fastest per-room patient ramp-up in the history of proton therapy. Demonstrating that compact proton therapy is a viable option for any size cancer center is core to Mevion’s mission of making proton therapy accessible to as many patients as possible.